Bandicam Company has announced that the new version of Bandicam fully supports the hardware accelerated H.264 video encoders of Intel, NVIDIA and AMD. The term "hardware acceleration" describes the use of computer hardware to perform some functions at faster speeds than software running on general-purpose CPUs. It allows developers to increase the performance of their software. The hardware accelerated H.264 video encoding technologies are used for reducing CPU time in video editors, video converters, and video recorders. There are three major hardware accelerated H.264 encoders: Intel Quick Sync Video, NVIDIA CUDA and AMD VCE. Bandicam now fully supports these new systems. Released in 2009, Bandicam is currently the second most widely used video recorder among gamers after Fraps (Beepa Pty Ltd). Bandicam can record original gameplay in both DirectX and OpenGL with its video capturing technology. Furthermore, it also compresses the video while recording, thereby making the recorded file size much smaller than other software. Bandicam uses various techniques to improve the recording performance. Previously, the program experienced difficulties with high definition game recording with a low-end CPU. When the video resolution was higher than 1080p, this caused lag because the software had to both record and compress these substantially larger files simultaneously. However, this problem has been solved by the hardware accelerated H.264 video encoding technologies of hardware manufacturers. As a result, gamers are now able to get a high quality gameplay video and a reduced video file size due to the improved combination of video compressing technology from Bandicam and hardware manufacturers. Zun, the manager of Bandicam Company, said that "Arguably, the most important factors of video recording are supporting hardware-acceleration, and these new technologies will allow users to record the target in high speed and with a high compression ratio and an excellent quality". The new hardware accelerated Bandicam can be downloaded from Bandicam.com. Bandicam is software that enables the user to capture screenshots and or video recordings of anything on the computer screen. Bandicam captures images and videos with the level of quality of the original display. The performance of Bandicam as screen recording software is beyond any other software that offers similar services. Bandicam makes it easy for users to set their preferences and the default storage location. YouTube gaming scene has seen a massive rise of 343% in live game streaming in 2017 whereas twitch grew by 197%. While the percentage does not always paint the true picture (because Twitch is still miles ahead of YouTube when it comes to live game streamers and viewers), YouTube gaming scenario has undoubtedly attracted a good number of live game streamers recently. Screen recording programs have become a lot more common as you might think about them. As far as my memory serves me, Fraps was one of the first recording and capturing software I had used, but sadly, the developers canned that project and never decided to revive it. The software still works, but not on the modern hardware. The go-to video and screen capture tool for gamers, Bandicam is a great tool for multiple use cases. End users (aka gamers) are able to record their gameplay and upload their adventures to online streaming sites. Bandicam 4.0 is a powerful All in One Recording Software for your computer. 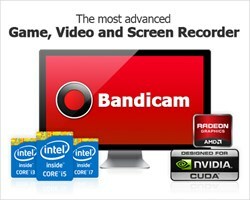 Bandicam is reborn as all-in-one, screen-recording software with a more intuitive user interface. Bandicam 4.0.0 is a major update that includes a renewal of the skin design, corresponding with video-creation scenes, and enabling improved productivity when making videos. Bandicam is a software package that is able to record game play and screen recording videos, all in a lightweight package. With Bandicam, you can record a specific area on a PC, or capture gameplay that uses one of many common graphics technologies. Bandicam, the worldwide leader in the recording software market, supports 4K video recording and 120 FPS game recording with GPU hardware acceleration. Bandicam Company, the developer of Bandicam, released a new video cutting program called Bandicut. Bandicut is a very fast video cutting program with an easy to use interface. This program is able to cut videos without encoding, and the user can clip a part of video quickly while keeping the original video quality. The quality of the recordings is good, even with a high compression ratio. Bandicam features a compact interface which lets you record or take snapshots of your screen instantly. Bandicam is a good alternative to Fraps because it records not only the DirectX/OpenGL programs like Fraps but also it can record anything on your PC screen including flash/java games. Bandicam, unlike most of the products of this sort, offers you a pretty simple interface that won’t leave you in a panic state even if you belong to the “technologically challenged” category. With YouTube as host platform, video has gained a top front spot in today’s Internet life. Programs to video capture your movement on the desktop are plenty, but Bandicam stands out through ease of use and simplicity of the options. Bandicam has gained global acceptance within 3 months of its release according to a recent report. The reasons for this might not be unconnected with the low computer lag; high quality video recording that endears Bandicam to the hearts of online video game sharing lovers. Bandicam, fully featured and functional video capture software, is taking the gaming world by storm. Bandicam Company released Bandicam globally earlier this year. In less than three months, it has become very popular among online gamers. Bandicam is a lightweight program to record game and desktop. You can record a certain area on a PC screen, or a program that uses the DirectX/OpenGL graphics technologies with ease and high quality.